The American business magnate, politician and philanthropist served as the 108th Mayor of New York City from 2002 to 2013. He is the founder and 88% owner of Bloomberg L.P., the global financial data and media company notable for its Bloomberg Terminal. 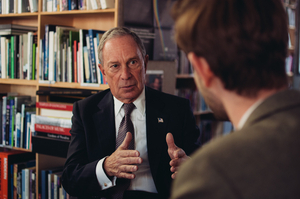 Bloomberg is one of America’s leading philanthropists. As a former mayor of New York City, Michael Bloomberg knows what challenges cities have to face today and how to respond to them. He told Max Tholl what states should learn from cities and how the mayor of even a small rural town could save the world.